Bobby Horton's Melody Blog: Fish, Teddy! Back in 1998, we did a west coast Horton Brothers tour. I ended up taking my truck because we were splittin' the tour with the Hot Club of Cowtown. So it was myself, T Jarrod Bonta, and Derek Peterson crammed into my truck. Somewhere along the way we picked up a cassette (remember those?) of Ole Rasmussen and the Nebraska Cornhuskers. We wore that thing out. Sure, they were basically a rip of Bob Wills and His Texas Playboys but they were top-notch. Their singer, Teddy Wilds, was a mighty fine singer and the band was pretty happenin' too. We were hooked (no pun intended) on songs like "We're Gonna Go Fishin'" ("fish, Teddy"! ), "Ramblin' Blues", and "Did The Man In The Moon Come From Texas". A couple of years later, I tracked down the group's steel player, Billy Tonnesen, and gave him a call. He was still residing in Southern California and was more than willing to chat with me. So I called up my pals--Dave "Pappy" Stuckey and Jeremy "JW" Wakefield--and we set up a visit with Mr. Tonnesen. We spent the better part of an afternoon listening to him tell stories from the time he spent with Ole Rasmussen. 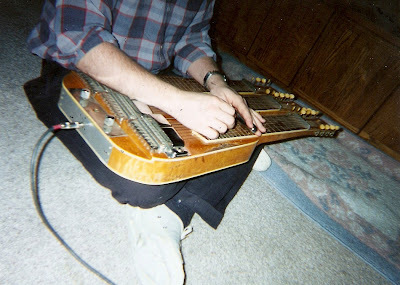 A few months later--in April of 2000--JW and I decided to drop in on Billy again and check out his steel guitar. This is me pickin' on this beautiful instrument. It's a custom made job that looks like a cross between an early Rickenbacker and a Bigsby steel guitar. This is a picture of Billy Tonnesen (shoeless!) 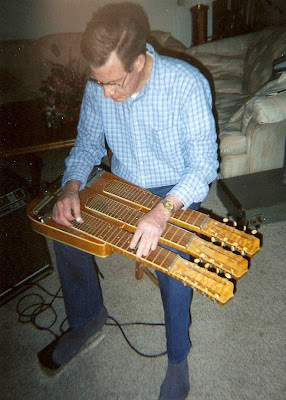 playing us a tune on his steel guitar. And here's a clip of Rasmussen and band backing up Tommy Duncan. Billy's playing his custom steel guitar in this one. That video is the coolest thing I've seen in a long time! Thanks for posting it, Bobby. Where is Dave Stuckey hiding these days? I haven't heard a thing from him since " Get A Load of This " back in Y2K. It's an all-time fave of mine. Dave Stuckey's keeping busy around LA with bands like The Lucky Stars, The Dave and Deke Combo, and the Bonebrake Syncapators. He's played a couple of festivals with the Rhythm Gang lately, too. So he's still around!